Just over two and a bit weeks until Cycle Dindi. 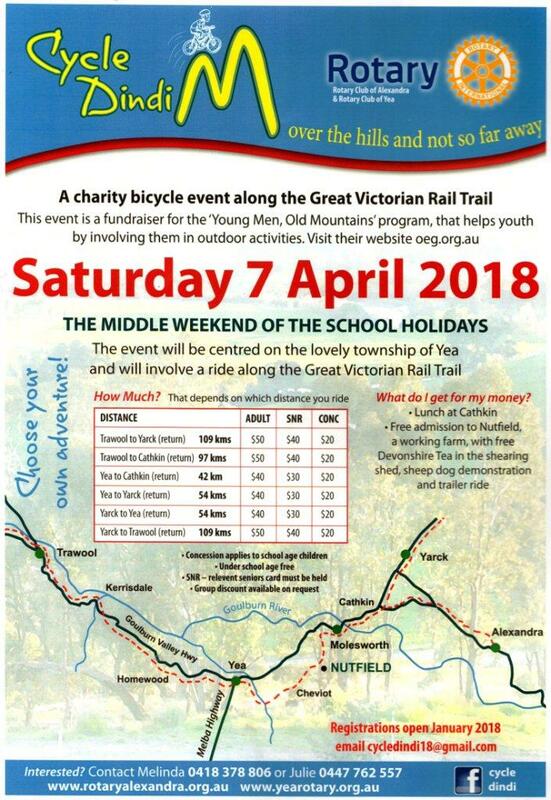 Still time to get in a little riding before the event, but even if you don't, you can still join us and enjoy the delights of the Great Victorian Rail Trail and Rotary's hospitality and support the youth in our District in the process. 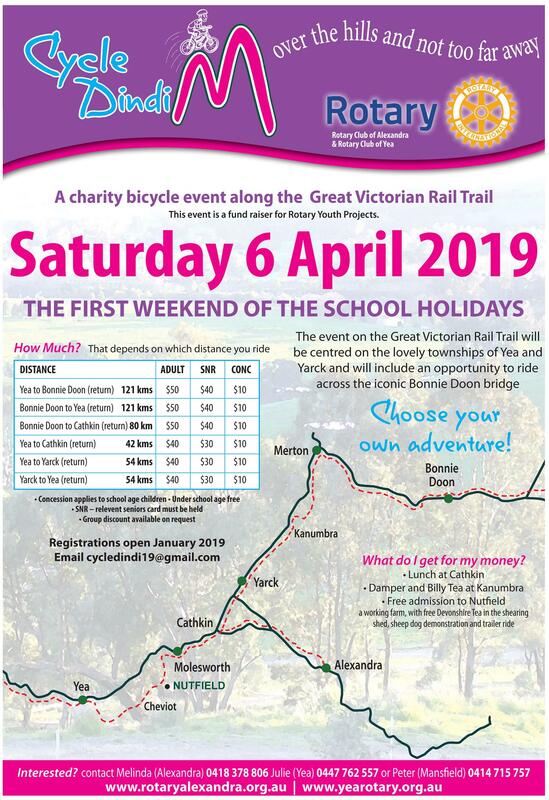 Sat 6th April, start from Yea, Yarck or Bonnie Doon anytime from 8am until 11am. Credit card payment available only at Yea. Why not register early and pay at either Try Booking or direct deposit. Details and rego forms at www.yearotary.org.au. Wonderful evening with Seymour Rotary playing golf. Another wonderful event with over 200 music lovers braving the heat. Isaac Sims who many know as a Buxton singer/guitarist got the day rocking. Local Joe Talia entertained us with Piedmont ragtime and country blues. Wonderful entertainment. The headline act was Nice Boy Tom (not me!). Jack Mithen, who many know as a music teacher at local schools, with his band displayed energy and camaraderie. The 5 piece band was outstanding. The crowd grew especially thanks to the live broadcast by UGFM (thanks Peter Weeks) that encourage many locals and visitors to Alex to this event. When you buy a ticket at the Rotary wood raffles over winter you realise that this means that free events like this can happen. Another major fund raiser is the Easter Art show and raffle. As course events like these couldn't occur without Pam and Joe Talia who organised the entertainment, Noel McIwraith and her Rotary supporters. Again thanks to all those who attended. it was fantastic to see so many families. Rotary Club of Alexandra joins a multi Club aid program. Currently 10 schools in rural communities in North East Malaysia are part of a project to improve their students English proficiency. Yes, it is a very ambitious project and the local Rotary Club of Kora Kinabalu Pearl has sought aid to expand the project to all 300 schools in the area. 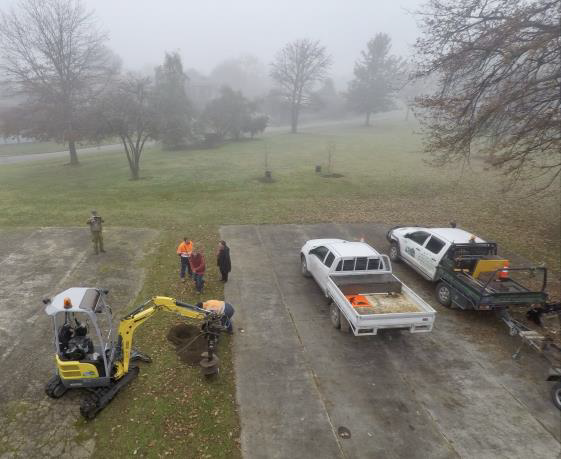 David Anderson, a past District Governor from the Rotary Club of Yea, took up the challenge and has coordinated the response from the Rotary Clubs of Southern Mitchel, Seymour, Kinglake Ranges, Yea, Alexandra and Mansfield to make the project a Sub-District 9790 effort. When David addressed the Rotary Club of Alexandra last Wednesday night, he explained that $835AU from each club will support two new schools to enter the program. It is aimed at years 4, 5 and 6. The first step is to give each student an English – Malay dictionary, then establish ‘English Corners’ in each school, providing 700 books in English and TVs and videos in English to improve these critical English language skills. Teachers have specialised English language skills training and the tools to present the program. The project has developed to the point that a matching grant from Rotary International’s Foundation has been applied for. David said the 300 - school target is achievable and the trial work that began in 3 schools is now working very effectively in 10. The key issue for any aid program is to have a local champion and the Rotary Club of Kota Kinabalu Pearl have stepped up and committed to this very ambitious goal. It is a collaborative project between Rotary, Sabah State Education Department and School Parent Teachers Associations. Knowing your dollar will make a difference and that the school is getting the full 100 cents in the dollar builds the confidence that will ensure success. David is very enthusiastic about the potential of international understanding this project will create. The central highlands of Victoria now have some new friends in Malaysia. Kota Kinabalu is five days travel from Singapore so it is quite remote even in Australian terms yet with today’s modern communication systems English is essential for future success for these students. Being on a similar time zone David is sure that the relationships with this part of Malaysia will grow significantly. 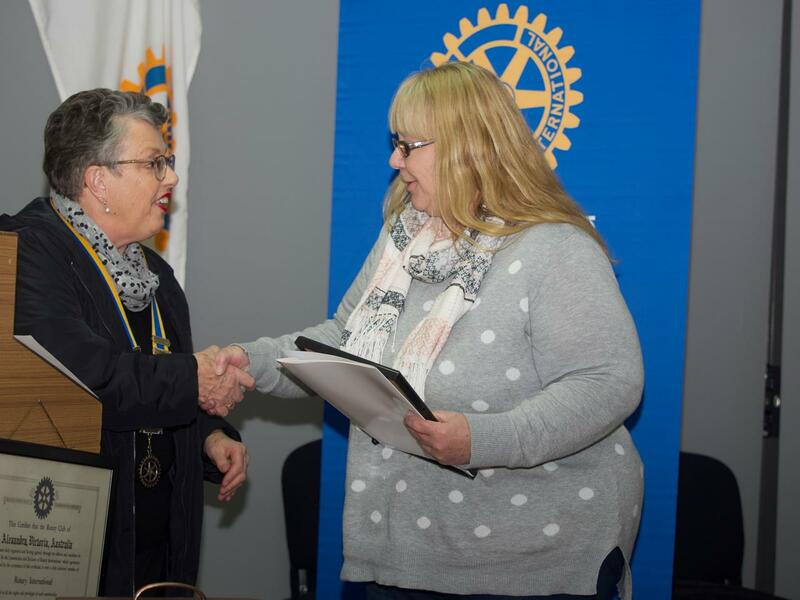 In receiving the cheque from Rotary Club of Alexandra’s International Director Lynda Robinson, David congratulated the Club on its commitment to International Service which is added to now with support for this English language learning program. He thanked the Rotary Club of Alexandra and the Alexandra district community who support the Rotary fundraising events like the Easter Art Show that enable these programs to be supported. The matching grant program means that the local contribution will double and the impact on the ground brings the 300 school target so much closer. Thank you. Enjoy the music, bring the family. As part of our program members occasionally are asked to give a talk about their lives. This week Emily Marr and John Cannon gave theirs. Emily was born in Kinglake She had a pretty typical country up bring: encouraged to spend time outdoors, climbing trees, looking after animals (domestic and injured wildlife). She went to school at Middle Kinglake. Sadly, the historic school building burnt in the 09’ fires. She completed her secondary education at Yea High school. The downside was the long hour each way bus trip on probably the oldest fallons bus in the fleet for 6 years. I always had a passion and skill for science-based subjects and was often prompted to aim higher then my expectations. I graduated in 2008 and scored my 1st preference to study a Bachelor of Science at the University of Melbourne with a rural scholarship towards my studies. Starting uni was a tumultuous time for me: not only was the university huge and a place I knew nobody, but the day after I moved my stuff out of our kinglake home the 09’ fires came through. My mum rang to tell me she was off the mountain and safe before we even knew a fire was hitting Kinglake from the tv news teams!! We sent a week believing our house was destroyed from all accounts, however, amazingly a wind change saved our street unlike so many others. In 2012 I was about to graduate and still was unsure where I was headed. I still knew I wanted to do something that involved helping and educating others, however, was beginning to question if classroom teaching was for me. I sent in the physiotherapy application on a whim as my physiology teacher thought I had the personality traits and skills to be good at it and was lucky enough to score an interview. I graduated with a Bachelor of Science majoring in physiology and moved straight into my Physiotherapy studies. I really enjoyed the physiotherapy course, it exposed us to all the many areas of work physiotherapy can have an impact. As our placements were location-based most of mine were out of the Austin and repat hospitals in Heidelberg. My favourite was GEM/neuro in both acute and rehab levels and this is still the area I think I’d like to focus on going forward. For a while I did think about specialising in paediatrics, even doing a placement I QLD at a private practice, however, as much as I loved the work, I found it very emotionally draining. I also kept busy in my ‘spare time’ with continued mentoring roles for new students, orientation day tours and helping in the good Friday appeal teddy bear hospital. I graduated in 2012 with a Doctor of physiotherapy degree (note I am not a ‘doctor’ by title). I went on to work in residential aged care and rehab and was placed at park lane aged care in Croydon. Originally to assist an accreditation and maternity leave cover, however, after 6 months I ended up taking over as the lead physio 4 days a week. It was a huge role as the site has 104 residents to 1 physio, and while I enjoyed it, the long days and work pressures began to creep up. Decided I needed a change and to try working in a different field to broaden my skills. 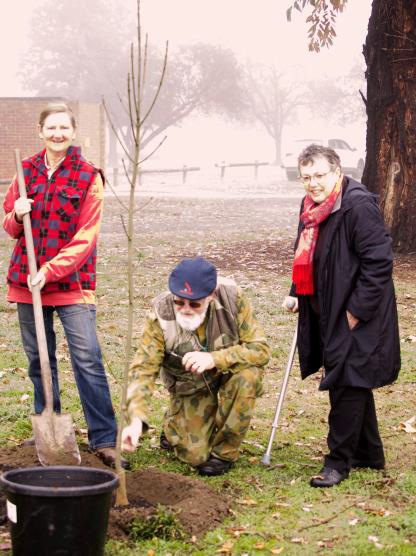 I also wanted to start giving back again assist in community projects as my family used to do in Kinglake. I choose rotary as I had been considering joining Rotaract as friends of mine were members and I had enjoyed fundraising dinners and trivia nights if attendance as a guest. Not one within 90min so thought why not just join anyway. And being in this club you can see that while we are a small club what we do locally every year has a huge impact on community togetherness and fun, whilst also providing opportunities for young people and recognising local talent which wouldn’t be possible if we were to fold. I also, crazily, accepted a request to aid in the re-launching of the venturing scout program in Alexandra as I enjoy outdoor activities, especially bushwalking, and saw it as a good way to help promote youth growth and skill building. John Cannon born in 1944 and spent his early childhood in Melbourne and he often recalls time spent exploring the family home and his family’s love of music. 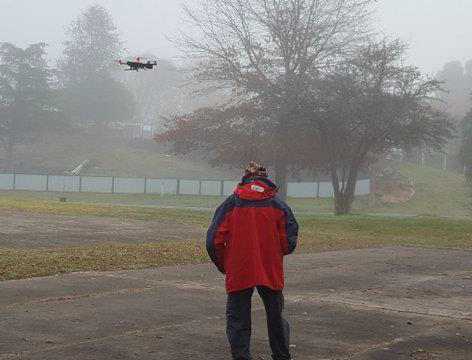 His teenage years were spent in Bendigo a virtual paradise for a boy playing baseball, building and flying model aircraft, and experimenting with all sorts of things. His father was a driving force in the Bendigo Operatic Society. Teaching was his chosen vocation and his place of learning the Bendigo teachers college. His first schools were rural schools in central Victoria and Mallee at a time when the local school teacher always played football , spotlighted for rabbits and foxes and John was involved in everything, except his football skills were not up to those of his AFL team, Essendon. 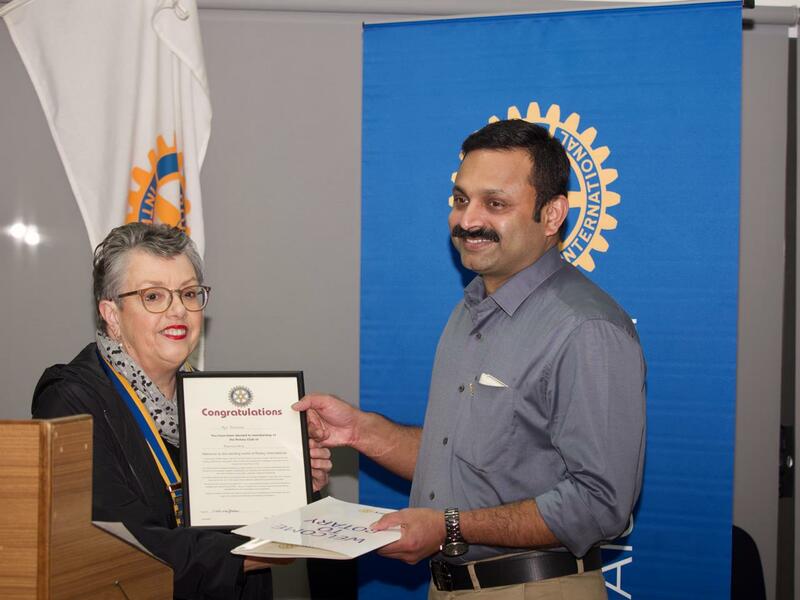 Two inspiring Rotarians recognised. Linda with a Paul Harris Award. John with a Sapphire pin. Well deserved. Congratulations. Download entry form etc from this page. A fun day for all the family raising funds to help local youth. Wonderful effort again by Noel McIlwraith. Christmas trees come and see. Alexandra Shire Hall Wednesday to Sunday 10am to 9pm until Christmas. Gold coin donation. 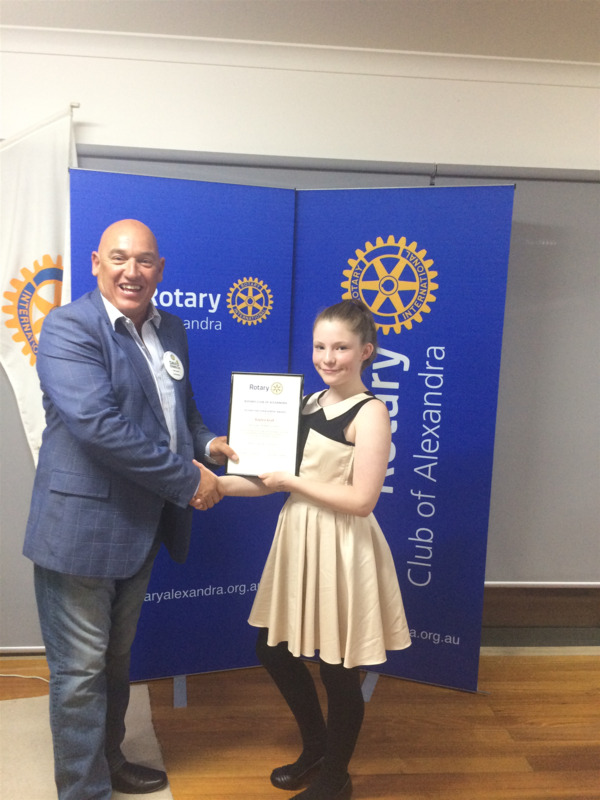 Last Wednesday night was the Rotary Club of Alexandra’s students award night. The student encouragement awards recognise citizenship and involvement in the student’s community, one Year 6 student from each of the Alexandra, Buxton, Eildon, Marysville and St. Mary’s primary schools, and 2 Citizenship Awards to Alexandra Secondary College Year 12 students. The awardees for 2018 all were outstanding young people who have demonstrated commitment to themselves and their community. The citations read out by each school’s teacher told of young people who are on their way to being outstanding citizens prepared to go the extra bit to make sure a task is well done and ensure effective involvement of all. All awardees demonstrated an ability to deal with adversity in a positive and practical way. The local community can be proud of our young people and this group of leaders show us that the future is in good hands. 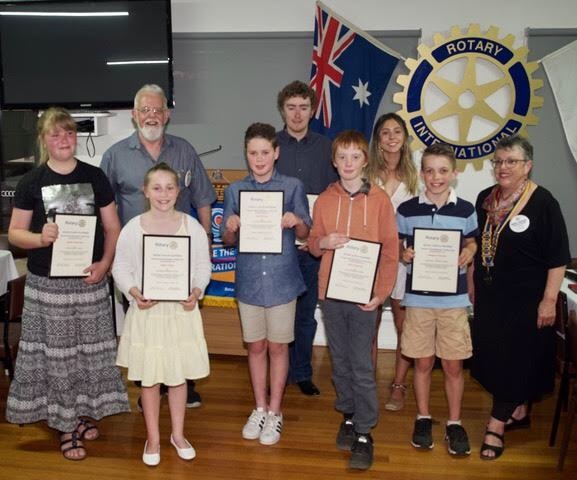 Over 80 Rotarians, special student guests, their family and friends gathered at the Alexandra Golf Club to celebrate the achievements of these young students and be part of the awards night. The Primary School Year 6 students Encouragement Awards are presented with a certificate and $300 to assist them with their secondary education while the Year 12 Alexandra Secondary College students not only received a certificate and a Fitbit Versa Smart Watch to help manage their busy lives. This replaces the Citizen Watch that has been the regular gift to the Secondary College Citizens of the Year. The Fitbit Versa Smart Watch has much more to offer than to tell the time, very accurately, just as these young people have so much to offer our community and our future. The primary school awardees were: From Alexandra, Hattie Langley; Buxton, Mack Fitzpatrick; Eildon, Jessica Newman; Marysville, Matthew Thompson and St Mary’s, Tyler Richards. Rotary Club of Alexandra ’s President Melinda Jackson, in closing the evening, congratulated all the students in their outstanding achievements as citizens of our community and wished the primary students best wishes for a successful secondary education. Melinda specifically congratulated Maya and Oscar for their leadership in the community during a time in their lives where young people face many challenges. Melinda wished them every success in whatever they chose to do with their lives and confirmed that they were starting from a very good base. Finally, Melinda thanked the teachers and the community who have nurtured and taught these young people, ensuring that they and their peers grew up to be the best possible people they can, in particular to meet adversity with innovation and enthusiasm. Lincoln Budge an inspiration to all. An outstanding inspiring speaker at the Rotary Club of Alexandra . Lincoln Budge grew up in Yackandandah and by his own admission was a bit of a tear away as a young chap. He did a boilermaker apprenticeship in Wangaratta and returned to Yackandandah to work. To celebrate his 22nd birthday with three cars of mates, they headed into the mountains to do some 4 wheel driving. Lincoln was a passenger in the 3rd vehicle when it rolled down a steep embankment and he was trapped in the car in a pond. When his best friend got to him he could tell there was something wrong with Lincoln’s spine. As there was no phone reception some of the others had to drive to get help. Emergency services took 2 hours to get him out and it took another 5 hours to get him to hospital in Albury as they had to drive slowly so as not to put him through too much pain. From Albury he was taken to Melbourne where they realigned his spine but he was paralysed from the waist down. In rehab reality set in but Lincoln was determined to be able to live independently. He was surrounded by great friends who recognised when he needed help and when he wanted to do it himself. Realising he couldn’t do the things he used to he got into wheel chair basketball then being a keen water skier wanted to get back into a boat but didn’t know how until one of his mates picked him up and threw him into the driver’s seat. From then on he became the boat driver for the water skiers. He then found someone in Bendigo who showed him how he could water ski and then he gave snow skiing a go. He skied with Disabled Winter Sports Australia and was invited to ski at Thredbo for a week with the para olympian coach. He went to Colorado with the para Olympic team and fell in love with skiing. He travelled the world for 4 years skiing and was ranked in the top 50. He crashed when training for the Soci Olympics and hurt is shoulder but skied on for 2 days in pain until forced to pull out. Lincoln came home and had a shoulder injury for 2 years ending the skiing career. He decided to set up “Change my Life Program” talking to schools. 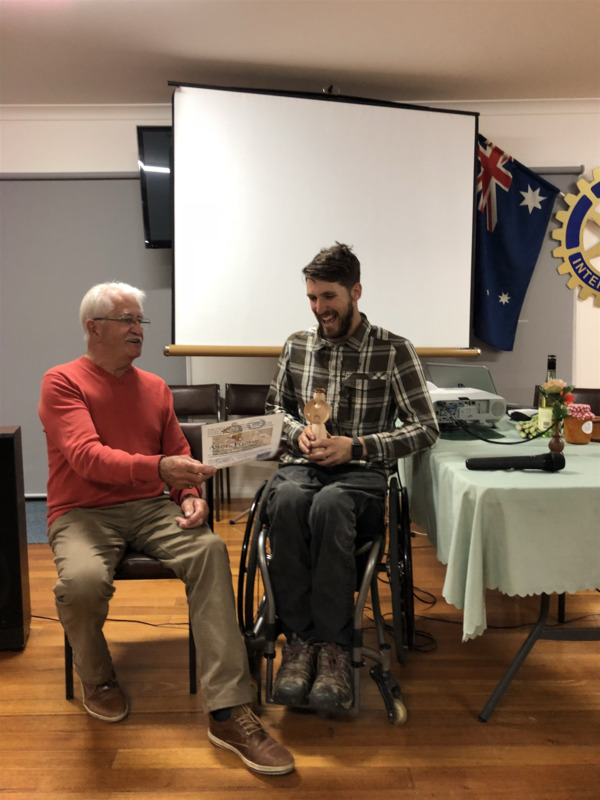 He needed $50,000 to set up with equipment for wheelchair basketball and initially the Masonic Lodge and Lions organised a fundraising night, then the Lions took it on as a project. Kubota Australia donated a $5000.00 ride on to raffle and he has had a lot of other support from community groups. So much so that he had all the needed equipment in 12 months. He now goes to schools to enlighten them on people with disabilities. When kids are in the basketball wheelchairs they forget that Lincoln has a disability. During the day before our meting he conducted wheelchair basketball with Year7s at Alexandra Secondary College sponsored by our Rotary Club. If you think you can help others by joining our Rotary Club contact our Secretary Chris Jackson on 0409402557 or 57722496 prospect.house@bigpond.com.au. Hat night for Rotary Health research. This week we based our night an the Melbourne Cup. We also combined this with Lift the Lid wearing hats to raise money for Rotary Mental Health programs. Approximately $600 has been raised locally from donation tins in local shops, collection outside Ian Davis' Pharmacy and all proceeds from our cup night. Diana Thomas won the best lady's hat, Ian and Liz won the horse race. Using dice to move along decking. Lynda the best overall and David the best male entry. Consider joining Rotary. It's great fun and supports many local, national and international causes. Meet first, third and Fifth Wednesday of the month. Thanks to staff from the Murrindindi Shire Council for supporting the “Lift the Lid” afternoon tea. The Rotary campaign encourages all businesses to raise awareness about Mental Health and also to donate towards mental health research. Some stats were about 45% of us will experience a mental illness in our lifetime. Australian Rotary Health is one of the largest independent funders of mental health research within Australia. Rotary Health provides funding into a broad range of general health areas, provide scholarships for rural medical and nursing students, as well as Indigenous health students. Australian Rotary Health provides funding into areas of health that do not readily attract funding, and promotes findings to the community. Remember that resilience is built by good nutrition, sleep, hydration, exercise, mindfulness/meditation, social connection and looking out for each other. A BIG thanks from Rotary to those who contributed food, made a donation and especially to those who wore a silly hat! Donations came to $143.55! October 24, 2018 was International Polio Day. It aims to raise awareness of the disease and its consequences, while also celebrating the fact that worldwide 99.8% of polio has been reduced since 1988. Now only 3 countries remain affected, however, reported cases have risen in 2018 to 20, with 16 cases reported in Afghanistan and 4 in Pakistan so far. The rotary club of Alexandra is pleased to support the ongoing global effort to END POLIO once and for all as no child should die from a vaccine preventable disease! Are you retired or just going part time and want to learn for the love of it, enjoying new adventures and making new friends? 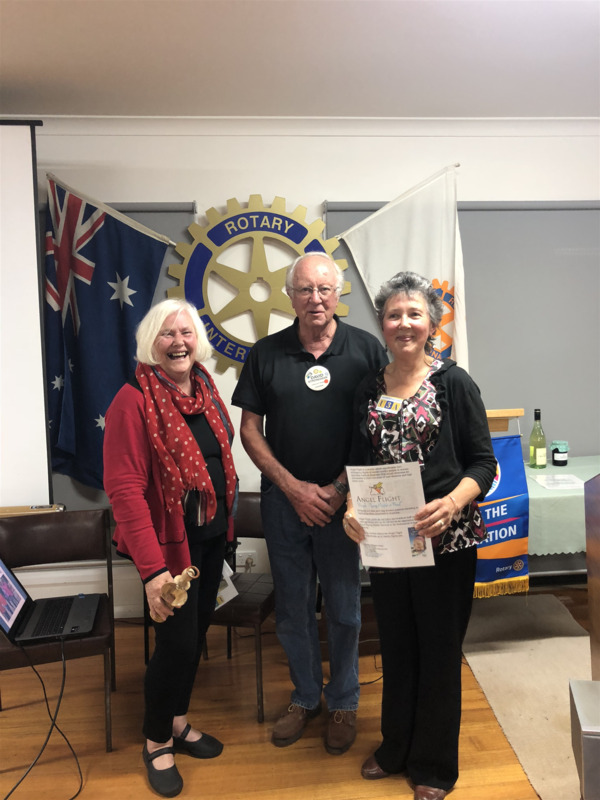 Our Rotarians were informed about the vast assortment of activities available and given a copy of the 2019 course program. Enrol from Nov 30 2018 for next year. Once you join these include writing and languages, creative arts and music, food, wine and gardens, health and well-being, history/ travel/ games, information technology and outdoor activities. Other events are day trips by bus, happy hour and a yearly interstate bus trip. If you look at their Facebook page Murrindindi East U3A you see many smiling faces. What do you call a person smiling on Monday? 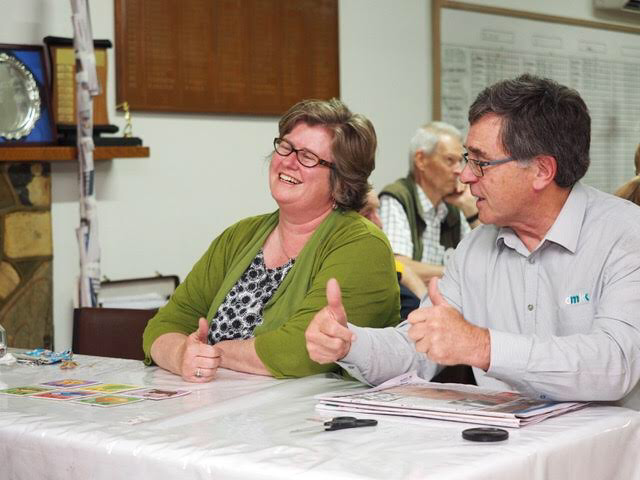 District Governor Malcolm and his wife Jill visited Rotary Alexandra this week. Theme - being the inspiration presented to governors elect in SAN Diego. 2000 people - sets of bongos - taught how to play basics in 15mins. Idea - teach , support and combine people with common purpose /theme can achieve a lot. Be “the “ inspiration is quite definitive - who what when where why - 5 questions asked about the theme. First two who and what made me think. Decided who - me to inspire others Rotarians or should I be inspiring non Rotarians. Decided the first. Until realised 3rd possibility - that is to inspire myself - to be a better Rotarian and will therefore inspire the other two. Service - all clubs do service - for all things you do in your Community do a great job. Integrity - so far haven’t met a person that isn’t honest Diversity - we are all different- different professions and backgrounds to pop, resources and skills, often target people in different professions. Leadership- different definitions of leadership but all efforts to make a difference on committees run events etc mean leadership. Rotary gives opportunity to develop leadership. We all acquire confidence and skills through our work in Rotary. So give Alex 5 out of 5 - you love what you’re doing and being a Rotary club. Hope to inspire you to “ be the inspiration” and inspire yourself and others to be a better person. Jill spoke - partners project is rural aid - grew up in Hay and aware of effect of weather drought, fire, flood, frost hail. Buy a bale delivered more than 4000000 bales of hay. Provide logistical and emotional support, adding, rural counselling and others services. Recently trucks to Connabarbran, and Mudgee. Recently employed 7 new counsellors, eg hampers don’t help rural businesses. Maintain lifeline to farmers. Melinda provided a cheque to support Jill’s project. Welcome Aju Thomas and Sharen Robinson who have just joined. What does Alexandra Rotary do? With Rotary Yea organise and run Cycle Dindi to raise funds for local youth initiatives. Conduct with Lions the Australia Day Celebrations; Organisation, breakfast and game Organise and help run Carols in the park and Music in the Park. Conduct the Easter Art Show & run a raffle and sell tickets in the main street. You need to be a person of good character and standing, with a willingness to give something back to your community. Be prepared to have fun along the way and meet a whole new circle of friends. You need to be willing to commit yourself, mostly in terms of some time towards service and fellowship. This is further explained at a dinner meeting. It is difficult, in a few words here, to explain why people join Rotary. The members look forward to your possible involvement, and are only more than happy to discuss with you what we do, why we do it, and how. 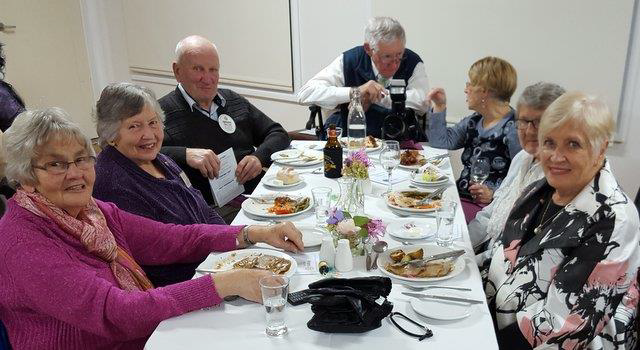 The Rotary Club of Alexandra meets for dinner on the first, third and fifth Wednesday evenings at The Alexandra Golf Club, Gordon St Alexandra 6.30 for 7.00 p.m. Cost $20.00 for dinner and drinks at bar prices. 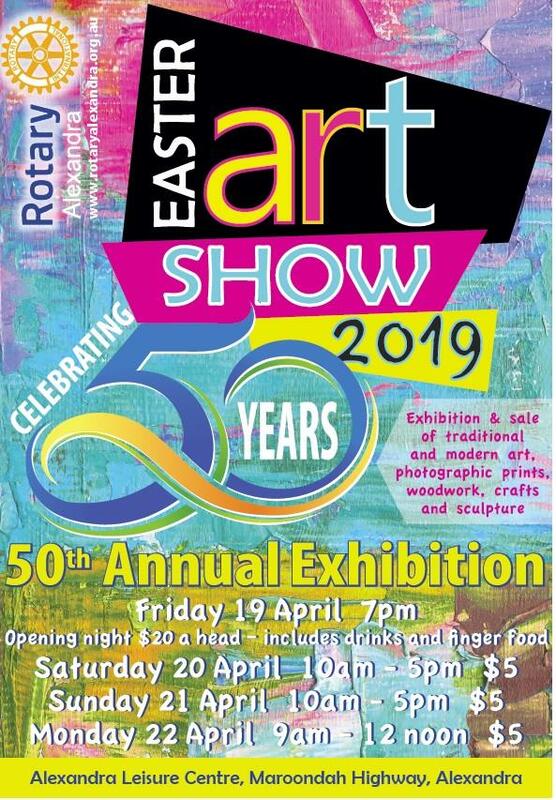 The Rotary Club of Alexandra Art Show Committee takes this opportunity to offer our thanks in appreciation for your participation in 2018 Easter Art Show. All participants are to be congratulated on the quality of the works displayed, as evidenced by the many comments received by organisers over the duration of the show. Ghosts Gums of the Pilbara, Christine Cafarella Pearce. Place Without a Postcard, Craig Davy. In due course you will be sent further correspondence inviting you to submit entries to the 2019 show, along with further relevant information. As the 2019 show will be the 50th edition, we are exploring ways to make it bigger and better. Toast to Rotary International by PP Rob Chaffe: Rotary International is identified by its symbols of excellence the Gear Wheel that is abbreviated to “the Rotary Wheel”. We know that symbols can be shallow promises and in the modern world we see and experience the consequences of unfulfilled promises yet shining out amidst all the Rotary Wheel. We know Rotary not through this symbol but through what the members of this organisation are driven by. They promote Peace, fight disease, provide clean water, save mothers and children, support education and grow local economics. High ideals indeed, but Rotary International has pledged $150 million US to help fund the eradication of Polio that will cost $1.5 Billion. To give you an idea as to the significance of this Australia has pledged $13 million. Yes only 8.37% of Rotary’s contribution. There are three parts to Rotary and the first is the Rotary Club, the second is Rotary International and the last the Rotary Foundation. World wide of the 7 billion people only 1.2 million are Rotarians and 35 000 Clubs. How is it possible that Rotary can make such an impact, by the way so far this year there have been no recorded cases of “wild” polio. Yes we have almost wiped out this debilitating disease world wide. How is this so? Rotarians think differently, see differently and act responsibly because we, the whole 1.2 million Rotarians are Common unity builders, problem solvers and people of action. Rotary international punches way above its weight where ever it is. Regrettably in the wider community Rotary is known only by the local Rotary Park or a sausage sizzle. In Alexandra its Driver Education Program has saved over 45 lives. It’s contribution to Rotary Foundation over 50 years amounts to over $100 000 US; this capital investment is never touched but the interest provides the money needed. Think what the compound interest on just $10 000 amounts to, let alone $100 000! It was a significant force to get Kellock Village off the ground in the 80’s and the development of the new library. It has welcomed over forty five students on the youth exchange program and sent out 35 students all over the world, 8 vocational exchange team members, six Rotary Foundation scholars and on and on. All this has been possible because of those 35 000 Rotary Clubs around the world come together through Rotary International. Now 113 years old Rotary International is one of the most dynamic, responsible and respected organisations in the world. Let’s shout it out that it is no secret anymore Rotary International is a vibrant energetic and responsible organisation that reaches around the world first a toast to Rotary International and then pop your poppers. The toast is Rotary International! Shout it out with your party poppers! management plan and to ensure that the easy maintenance of the park is not compromised. Karen Stevens from CEACA, co-ordinator of the L2P program, explained that the program has an urgent need for more mentors to assist learners under 21 years of age without access to a supervising driver or vehicle to get their 120 hours of driving experience required to apply for a probationary drivers licence. This community based program is a partnership between CEACA, VicRoads and TAC. A beautiful sunny autumn day with a cool breeze made walking a pleasure as 100’s turned out to be part of the Mother’s Day Walk to raise funds for breast cancer research. Every age group was represented as each walked to the level of their ability soaking up the warmth of the sun and being very glad of the protection from the cold southerly in the shady spots. It was the perfect finish in Rotary Park where the walkers and support people were greeted by a very tasty lunch of hot BBQ, fresh fruit and lots of water. A brilliant day put for the family and we trust a good sum of money was raised to assist this vital research. Special thanks to the organisers especially Kazza Stillman and the invitation to be part of this fun day out. The Alexandra Yea & Districts event is in its first year & offers participants a 24km walk from Yarck – Alexandra, 16.5km walk from Cathkin – Alexandra & 5km walk Koriella – Alexandra! A journey of 52000km begins with "an alarm clock ringing”? Jeremy Scott said that the hardest day of his life was the day his alarm clock woke him in central London England to the first day of a 2.5 year journey to Auckland New Zealand by bicycle! Jeremy as guest speaker at the Rotary Club of Alexandra’s meeting last week explained after six years of planning the day had come to actually get on his bicycle, for the first time fitted out with panniers, to ride home. The panniers had to carry everything he needed food, water, tent, clothes, camera etc. He was by himself, unsupported and it was up to him and him alone if he was to succeed. This was not the first time that he had taken on a challenge that would be life changing. Born with a congenital heart defect at the age of four he underwent cutting edge open heart surgery. Now at 45 years of age he looks back to the days when he underwent the surgery with a sense of relief and wonder that it was possible at all and to appreciate the utter dedication and professionalism of his surgeon Sir Brian Barrett-Boyes and his team. Just over half way through his trip home he found out just how cutting edge his operation was. He spoke to a fellow NewZealander in Vietnam who told him of his son who had the same heart condition as Jeremy and who had had the same surgeon. Jeremy’s response was “when can I meet him?” The answer was he could not as the operation was not a success. It turns out that this operation was 2 years before Jeremy’s and Sir Brian’s team had learnt so much that by the time Jeremy needed the operation they had the tools and processes developed by the heart research to ensure Jeremy could live a “normal” life. If you call cycling in 20 degree below and 45 degree above freezing temperatures, though 29 countries including Iran and the mysterious countries east of the Black Sea, camping with drug dealers and meeting so many people whose only desire was to help him on his way, normal. Thank heavens he took his trusty Nicon SLR camera with him, bulky and heavy but what images it captured. The 25 minutes of Jeremy’s address rushed by as the Rotarians and their guests tried to take in the images he showed on the screen and to wonder at his ability to do such a task. As Jeremy's nephew (aged 5 years) said “My uncle is riding around the world because he has a broken heart”. Now the second hardest day of his life was rushing at him. After travelling 52000km or 1.5 times the circumference of the earth he was actually at Auckland, home and he had made it. No more peddling! Well not quite, he has just embarked on a speaking tour around South East Australia and is planning a cycling trip around Australia in a year or so. Both challenges are to spread the word about heart research and to raise funds for heart research groups in the areas of his travel. 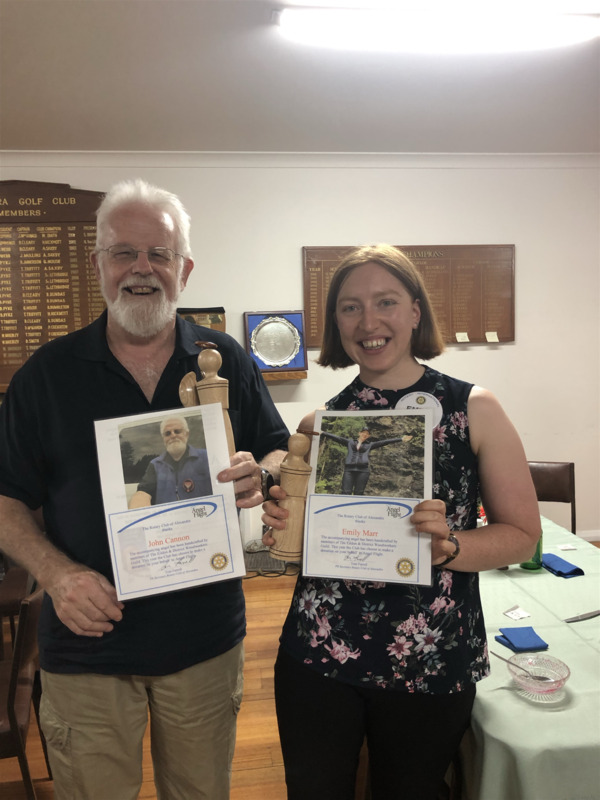 Rotarian Ron Sinclair, chairman for the evening, expressed the thanks of all present for the outstanding quality of his presentation and then handed over to president elect Melinda Jackson. Melinda also thanked Jeremy and presented him with a cheque for $500 from the Rotary Club of Alexandra for Heart Research. Jeremy was overwhelmed and he said that it was just the thing to keep him going. Jeremy also has captured his story in a book, the sale of which also raises funds for heart research, needless to say he sold a good number of books as well, a very successful night in all aspects. The big winner for the evening was the generosity of the human spirit across the globe and our ability to both deal with adversity while helping each other live healthier and rewarding lives. Jeremy said it was just what Rotarians do every day around the world. One and half times around the world on a bicycle. Jeremy Scott, who is guest speaker at the Rotary Club of Alexandra next Wednesday May 2nd, cycled from England to New Zealand a distance of nearly 52000 kilometres a distance equivalent to just on one and a half times around the world. So what? Jeremy, at the age of four needed major heart surgery with all the following consequences gave him a rollercoaster ride as he struggled to live a “normal” life. The major outcomes form this experience are a deep appreciation of how precious life is and the wonder of the goodness that surrounds each one of us. On the 5th October 2011 he set of from London, England and successfully cycled unassisted to New Zealand. Jeremy is an Australian Heart Foundation “Heart Hero” and an ambassador for the Waterline Challenge. The Waterline Challenge is to circumnavigate Australia's entire coastline, including rivers, lakes, and islands during the week of the 12th to 18th November 2018. It is a fund raising program designed to assist people facing a health challenge to overcome the adversity and build sustainable futures. 80% of the funds raised goes to the team’s nominated charity and 20% to be distributed amongst Cure Brain Cancer Foundation, Australian Marine Conservation Society, Surf Life Saving Australia, Royal Flying Doctor Service and a host of national initiatives for water quality and environmental projects. Jeremy is an outstanding speaker and has a wealth of experiences to share. If you would like to hear Jeremy speak at the Rotary Club of Alexandra’s meeting on Wednesday the 2nd May please contact Chris Jackson on 0409402557 or 57722496 or Email “prospect.house@bigpond.com.au” by noon TUESDAY 1st May. The cost of dinner and the speaker is $20. 6.00am dawn service at Leckie Park Memorial. 10.45am assemble at the RSL Hall for march to Leckie Park Memorial for 11.00am service. 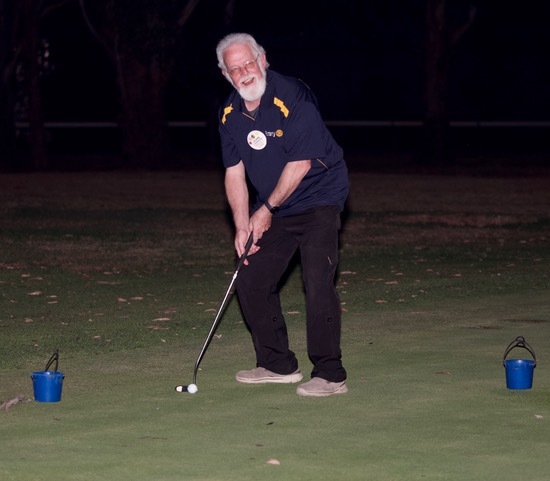 Alexandra Rotary will now have their meeting on March 14th at the Alexandra golf club to compete with Seymour Rotary in a fun putting competition. There is no meeting on March 7th. Contact Tom Farrell if you are interested in attending 0431887842 or by email tfarrell@dkc.net.au. A great night of fellowship and fun. Consider joining in the fun. 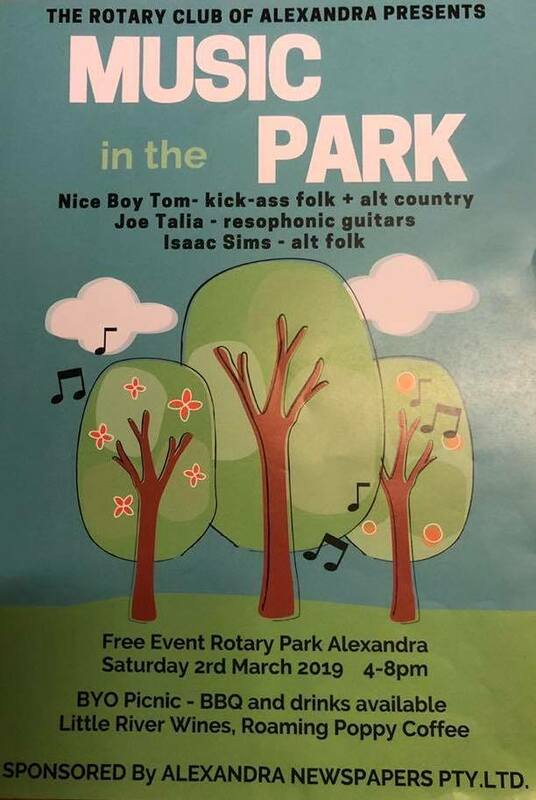 Rotary Alexandra extends an open invitation to all of our community to come and enjoy a free “Music in the Park” event on Saturday 3 March 2018, 4.00-8.00pm at Rotary Park. Our vision is our own mini “Day on the Green” experience – with people enjoying music, picnicking and connecting with each other in a relaxed atmosphere. We have 3 great acts lined up who will play two sets each. All of them are nationally recognised but also have personal links to our community. Trev Dwyer has twenty-two years playing and recording with various rock, blues, soul, funk, country, afro pop and acid jazz groups. Now performing solo with only his trusty acoustic guitar and a catalogue of classic acoustic blues, soul and jazz standards, he delivers each song with the passion and attention that only decades of experience can bring. Jo Talia is a local legend with a wide repertoire of roots guitar music of the pre-war blues, and influences from the great piedmont, ragtime and country blues masters such as Big Bill Broonzy, Mississippi John Hurt, Blind Blake and Tampa Red. Joe’s sophisticated fingerstyle of Boogie Woogie, vintage swing, cowboy jazz and bluegrass. People can bring their own picnics and drinks, or purchase on site. Rotary will have a BBQ, there will be an ice-cream van and Roaming Poppy will meet your hot drink needs. 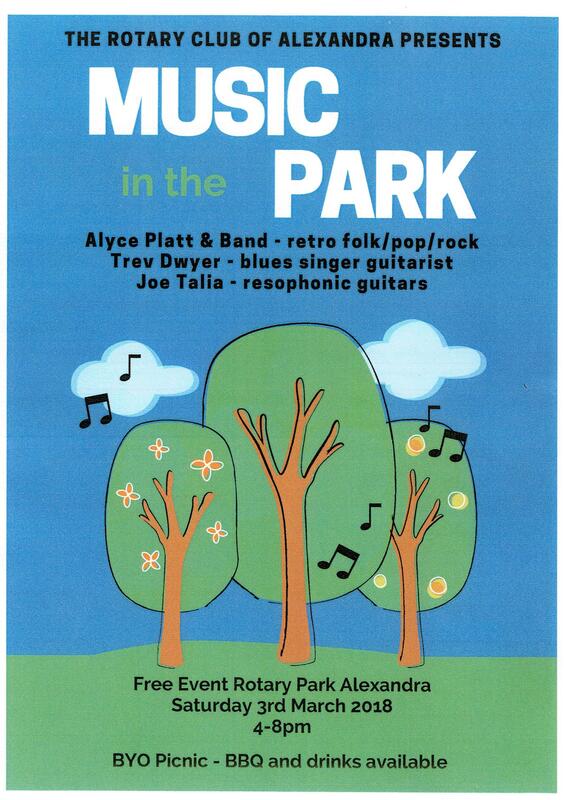 While we are hoping for a balmy evening of early Autumn ambience – there is a wet weather plan and the music will go ahead regardless at an alternative location. Full details will be on the Rotary Alexandra website and Facebook page if required. If this is successful and builds interest, Rotary plan to run more such events on a regular basis. Your ideas and feedback to Rotary are always welcome. See Community social media notice boards and on the Rotary Alexandra Facebook page for more information. James Gillespie 2017 Rotary National Youth Science Forum awardee . 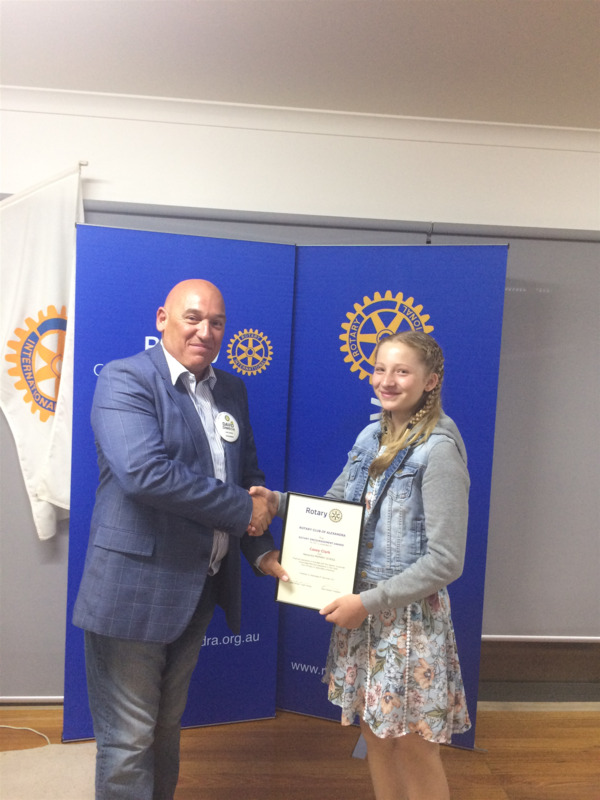 James Gillespie was the speaker at the Rotary Club of Alexandra sharing his experiences as one of 181Students from all over Australia who had the privilege of being part of the 2017 Rotary National Youth Science (NYSF). 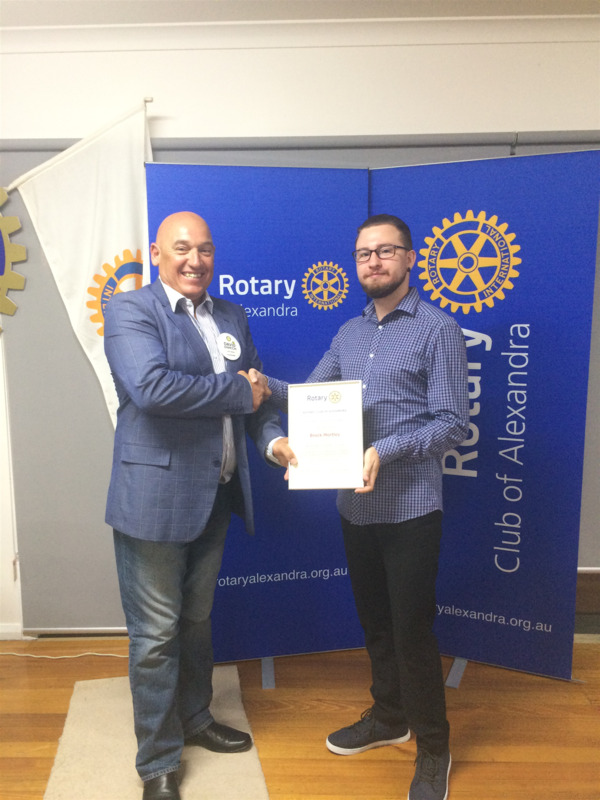 James was subjected to a rigorous selection process beginning with interviews by the Rotary Club of Alexandra and then by Rotary District 9790. In his presentation James highlighted the privilege it was to be selected on merit to attend the NYSF and how the assistance of his teacher Catherine Zerbie, his family and the Rotary Club of Alexandra was vital in the final selection process. James said the impact of this support really hit home as the 181 participants gathered for the first time at Emmanuel College of the University of Queensland. It turned out that about 90 of the awardees came from Victoria. To assist with the week long forum the main group was broken up into groups of interest and then were given a program to explore these interests plus a few other areas of science. James found himself in a group that were allocated the Technical Institute and the Brain research group. The technical institute focused on robotics and James said the things that were on ABC TV Catalyst this week he saw first hand. Robots that can physically weed a row crop or selectively spray plants the it had been trained to recognise as weeds or conduct soil and pasture analysis. Jame’s group had the opportunity to program a robotic arm. What looks so simple and natural is not so when you actually have to write every command to make things happen. The programming language used is very simple to use, the complexity comes when all parts (and there are quite a few) of the robotic arm must work together. Not only did this prove to be great fun, the conversations with his peers and the scientists (who were ever present to help and guide the NYSF awardees) was invaluable especially as ideas sparked new levels of thinking and processes and the ever present questions of “Why is it so” and “How do we make that happen” or just simply why? Jame’s group were introduced to Brain Research. As MRI scans open up windows into the workings of the brain and the body it unlocks pathways to treating many conditions including dementia. The fascinating ways that research is providing ways of treating spinal cord injuries and how the damaged spinal cord can, in some instances be repaired using “T” cells. Jame’s presentation concluded with the fact that Australia is the home of so much ground breaking research dealing with vital issues like dementia that impact on so many people. The NYSF program proved to be a real adventure in science and created many new friendships and associations that will be so important as he makes his next life choices. James said NYSF is an outstanding program and thanked Rotary and the wider community for the support required to sustain it. Rotarian Bruce Hyatt, chairman for the evening, thanked James for his presentation and complemented him on his ability to be chosen for the NYSF 2017 program. Bruce also said it was a privilege to have young people like James in our community combined with a Secondary College that has a record of excellence in developing the students who choose to apply for NYSF and other Rotary programs. Consider Joining us serve the community and have fun. 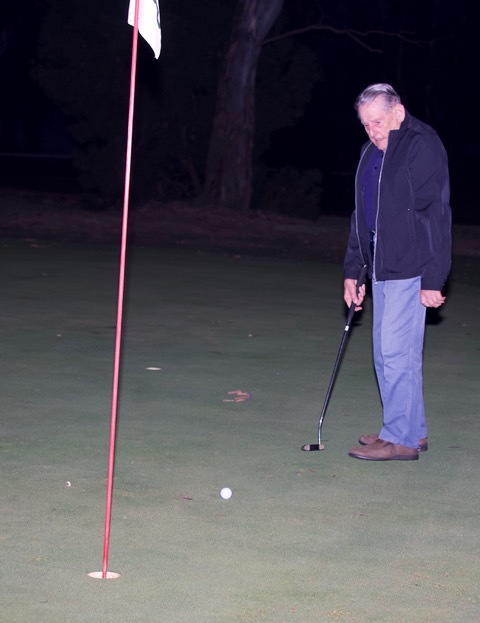 We now meet on the first and third Wednesdays of the month at the Golf Club. On the fifth Wednesday of the month we have a social night. The last social night involved quizzes and laughter trying to name logos and identify the meanings of 1920's slang. 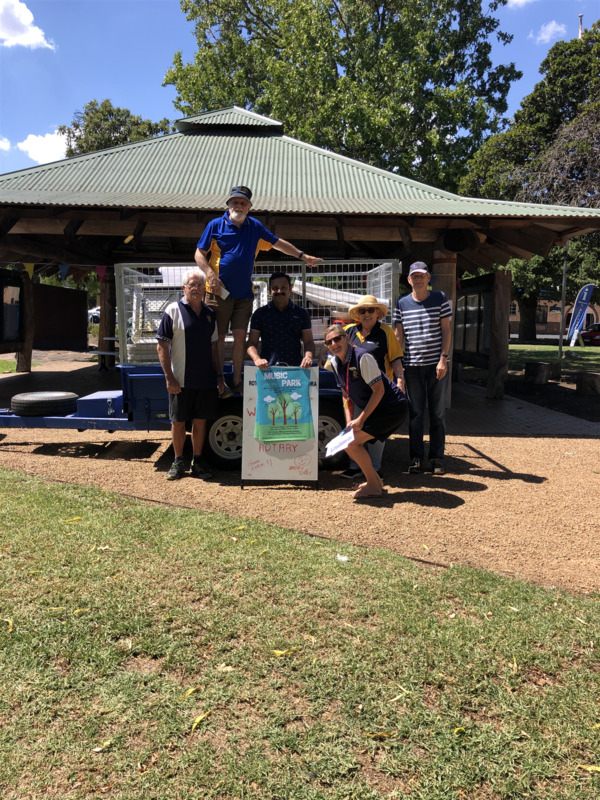 Locally Rotary is very active with Carols, Australia Day, Music the Park March 3 2018, Easter Art Show, Cycle Dindi April 7 2018, we help out at local events such as the show, Rodeo, open gardens, truck and Ute and ELF day. All activities are based on members volunteering no pressure. I've discovered if you want something done ask a busy person. Unless people like yourselves join us who will carry on these activities. Contact me via email on tfarrell@dkc.net.au even if all you want to do is come along to see if you might want to help. Free cooked breakfast, cereals etc. Bill had a long and distinguished police, law enforcement and emergency services career – including serving periods as Victoria Police Deputy Commissioner(Operations), Commissioner of Vanuatu Police (on secondment) and as Deputy Director (on secondment) with the Australian Bureau of Criminal Intelligence. Bill also served as Commissioner of Tasmania Police. In Vanuatu, Bill also held the positions of Principal Immigration Officer, Director of Prisons, Commander responsible for the Vanuatu Mobile Force, Secretary of the National Security Council and Chairman of the Residency Permit Committee. Bill was involved in the Fiji Police Training Project 1993-1994 and carried out review projects in Papua New Guinea, Solomon Islands and Cyprus. In Tasmania, whilst Commissioner of Police, he was also appointed the inaugural Secretary of the Department of Police & Emergency Services, Director of the Tasmanian Ambulance Service, Director of the Office of Emergency Services and was responsible for the Tasmanian Fire Service. He was an inaugural member of the National Road Trauma Advisory Council and a member of the National Committee on Violence. Bill resigned from Tasmania Police to take up the position of Director of Investigations & Criminal Justice with the National Crime Authority. Bill has worked for many years on various committees involved with road safety, community safety as well as crime, violence and injury prevention. He is the Immediate Past State President of Neighbourhood Watch. He was one of the long serving members of and Chaired the Victorian Community Council against Violence, is on the Executive Committee of the Australian Safer Communities Foundation, a member of Melbourne Safe City Leadership Group and chairs the Melbourne Injury Advisory Prevention Committee. Bill has been a member of the Community Safety Day/Week and now Month Reference Group since the inception of the program in Victoria. Bill was the Co-Chair of the Ministerial Crime & Violence Prevention Council and chaired its Weapons Working Group. Bill was a member of the Ministerial Burglary Reduction Council and the Ministerial Multicultural Affairs & Police Advisory Council. Association. He was an inaugural member of the Responsible Gambling Ministerial Advisory Council; is a member of the Problem Gambling Research & Training Centre Advisory Board and a member of the Victoria Police Blue Ribbon Day Community Council. Bill is an Australia Day Life Ambassador and was appointed a Member of the Order of Australia in the Australia Day 2009 Honours List. Making a difference repairing flooded fences. Following the flash flooding in the Yarck region, early December, Rotary Club of Alexandra member Sharon Fox asked the board to consider assisting the farmers who had lost a lot of boundary fencing. The Community Services Director swung into action on a fact finding mission to see how we could assist. As District 9790 had contributed substantially to purchase new equipment for the Benalla Emergency Fencing Team, contact was made to ascertain if they could help. Their response was immediately very positive and Alan Stafford together with a colleague arrived the next day to scope the work. Murrindindi Shire helped out by transporting the tractor with post hole digger on it from Benalla to Yarck. The Yarck Hall committee made the hall available for the workers to use for breakfasts and showers. The Rotary Club of Alexandra organised evening meal with the workers attending a Rotary meeting on the Wednesday night. 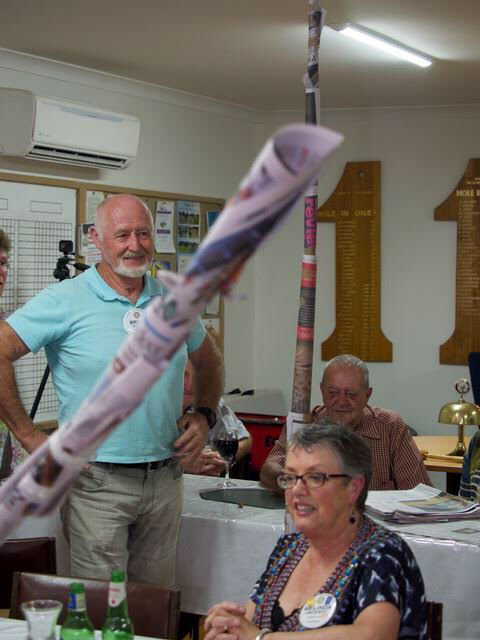 At this meeting Alan Stafford, coordinator for the Benalla Fencing Team, spoke on how it was great to be able to give a hand to the club which had liaised with District 9790 to raise funds to purchase their new equipment. The process with this group is that all materials and fuel are paid for by the property owner. Lunch is also provided and they all, including the farmers, sit and chat whilst having a break. Alan is of the opinion that the camaraderie and talk is all part of the process of assisting people to cope with these extraordinary events. Messages were sent out over the CFA system and through community radio asking if people needed assistance. The fencing team stayed in the area for about10days. Yea Rotary were also on standby to assist with catering if needed. This was truly Rotary in action making new friendships and renewing old ones. 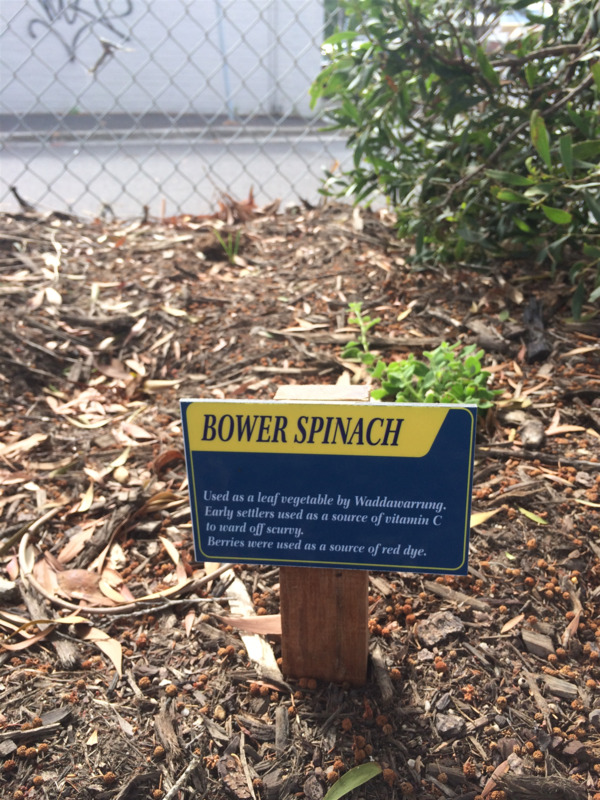 Submitted by Anne Reid, AG4. Rotary Clubs under the aegis of RAWCS Hands on Project - Rotarians and friends come together to build an artificial hand for land mine victims in Cambodia. 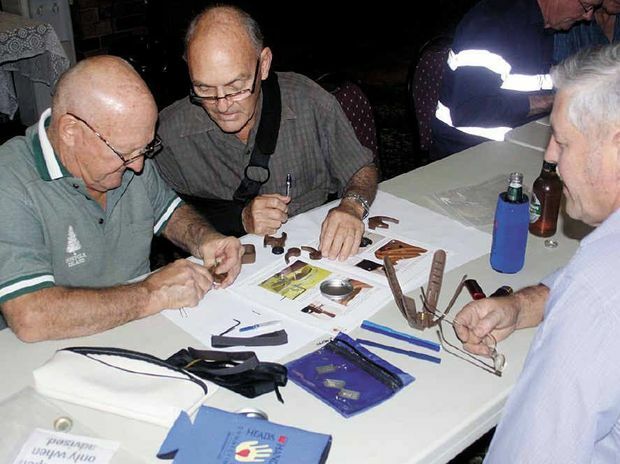 The Rotary Hands On Project involves building prosthetic hands from kit form and then distributing them overseas to victims of landmines and war. The hands are fitted to the recipient and they are trained how to use it. So far over 1300 hands have been fitted by Hands On Project Teams in Cambodia, Sri Lanka and Laos. Our neighbouring Rotary clubs were approached to support the project which resulted in commitments from local clubs for a total of 10 hands. We will be assembling our hands on Saturday 20 January then there will be the opportunity to have lunch together and share our experiences of the day. Our club is building two hands. Everyone is welcome to attend although not everyone will be able to participate in the hand building. Rotarians are very welcome to watch the assembly of the hands and there will be a presentation about the Hands on Project and the work it does to provide hands to victims of landmines and war. Its also a good opportunity to share the day with Rotarians from neighbouring clubs. Assembling the hands: The hands are assembled by a group of two. There is the option of swapping half way through the assembly to another team of two. Its important the hands are kept clean so no food or drink should be at the assembly table except for a bottle of water if you wish. Lunch: Everyone is welcome to have lunch together at The Grant Street Grocer, Grant Street, Alexandra. There are estimated to be 384,000 people with one or two hands missing from landmine accidents, many of which are children. There are around 120 million landmines still set in the world. Landmines are being cleared at a rate of 100,000 per year. There are 2000 accidents per month. Many people are also victims to cluster bombs, large ordnance which contain small "bombies" which remain unexploded in the ground. A wonderful night at Rotary in Alexandra. Three members were recognised for their outstanding effort helping the local and international community through Rotary. Robert Chaffe’s was presented with a Paul Harris Sapphire Award in recognition of his involvement with Rotary started in 1985 as a Group Study Exchange to Guelph, Canada. Since then he has been Rotary President and chaired too many Rotary committees to mention. 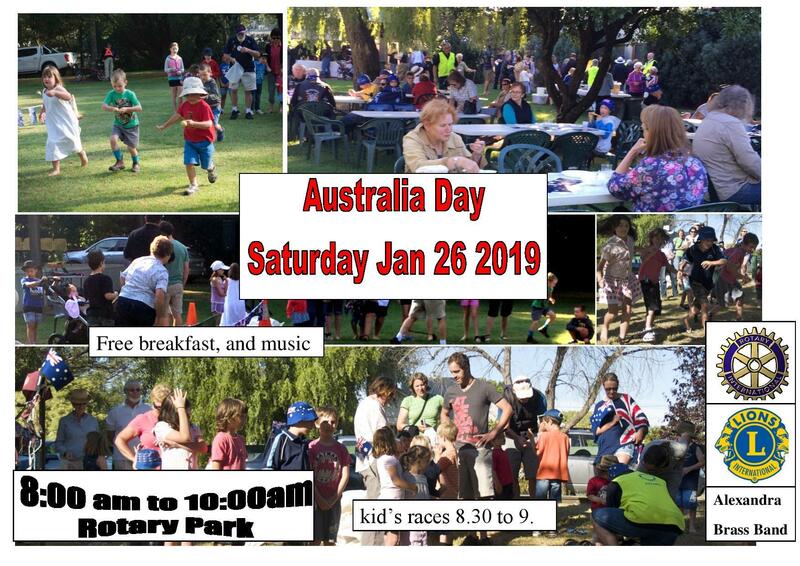 Highlights have been the Australia Day Celebrations, regular submissions of Rotary articles to the Standard, the shelter at the skate Park and the Leckie Park exercise stations. David Strongman was awarded a Paul Harris Fellowship for his exceptional effort serving the community through Rotary since 2004. His efforts helping with the Motor Cycle shows, Bush Fire Recovery and at all our events were recognised. Finally but not least was the awarding of a Paul Harris Fellowship to our current president David Dimech. This is David’s second stint as President. His dynamic personality had led to many achievements since he joined Rotary in 2011. 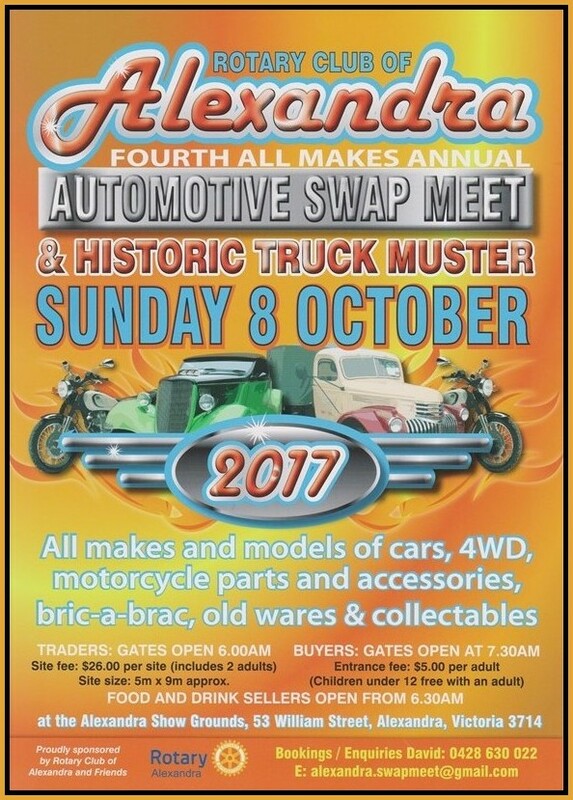 The Rotary Automotive Swap Meets over the last four years have been momentous tasks encouraging tourism and local interest. His instigation of Youth Discos at the Community Centre with the support of the Kilpatrick’s Mobile Disco was great. The rest of the night was full of fellowship and carols. This week the Rotary Club of Alexandra presented 4 primary students Ned, Casey, Lachlan and Kaylea with encouragement awards. Two VCE students Brock and Charmaine were presented with Citizenship Awards. It was wonderful to recognise their achievements and dedication. The Rotary Club of Amsterdam toasted our club. The Our Club has an established custom of toasting a Rotary Club from another country at our weekly meetings. This broadens our knowledge of clubs around the world. 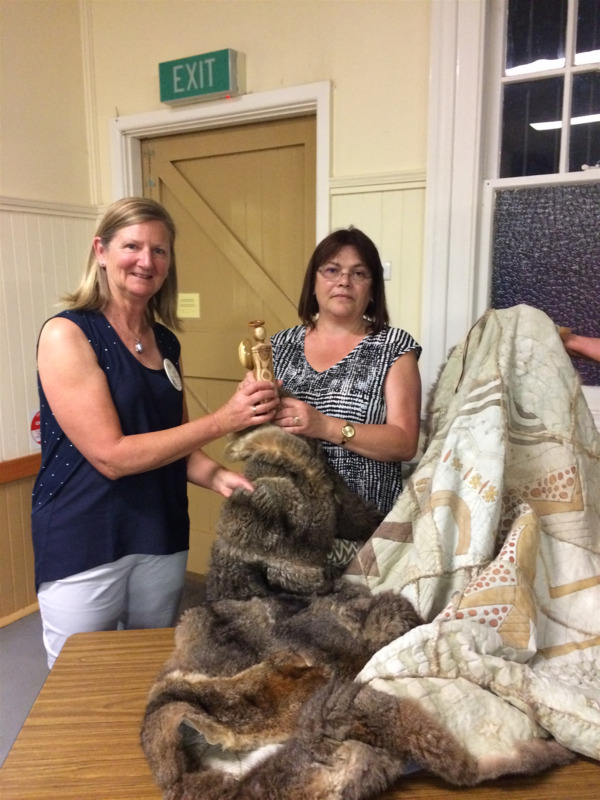 We had the pleasure of toasting your Club at our meeting. We wish your Club every success in your Rotary endeavours. We’d love to hear from your club. ▪ Cuts and collects wood for the annual wood action and provides free wood for those in genuine need. Thank you very much for your kind email and your toast to our club! On the picture at the back, you see the Amsterdam flag. This picture is a toast to your club, it was taken last Monday. 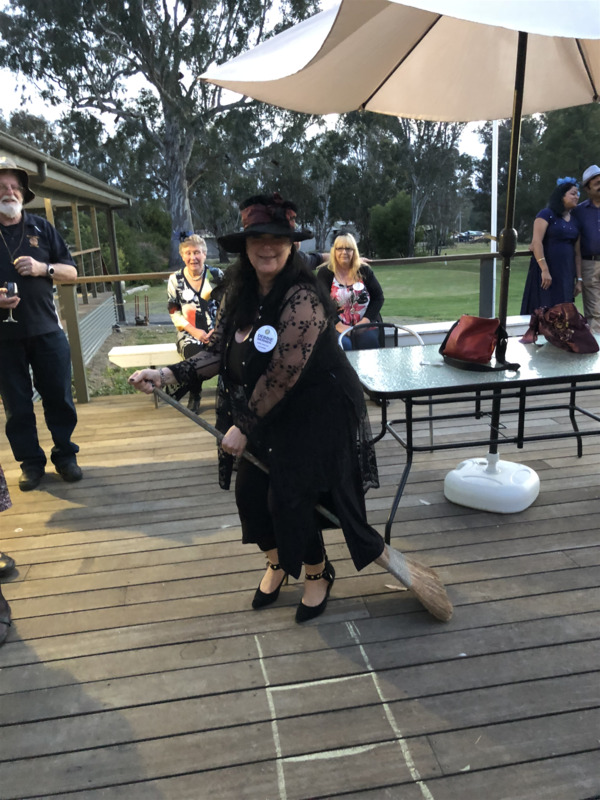 Last week Program Chair Lynda took over the night and gave us a night of fun and fellowship, she had us building castles with newspaper, doing jigsaws, and had the ladies emptying their handbags looking for all sorts of strange objects, and amazing what was found. Lee Healy from Tungurung Heritage gave an informative talk this week at Rotary. She is actively involved in preserving her native language and knowledge. 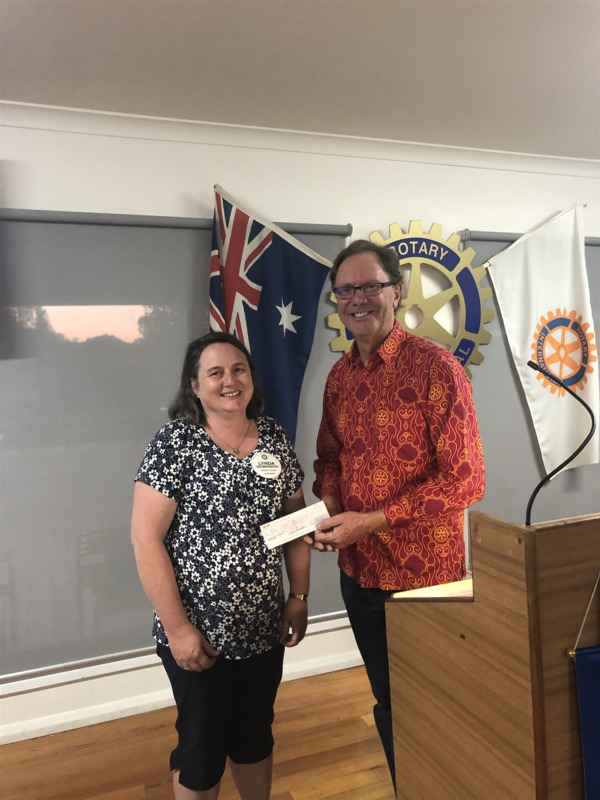 Rotary Club of Alexandra’s president David Dimech had great pleasure in presenting a cheque to Rotary District 9790 District Governor Bernie Bott with a cheque for $500 at last Wednesday’s nights Rotary meeting. The money is to go to Rotary District 9790 2017-2018 partners program to fund research 50% into Alzheimer’s disease and 50% into dementia. District Governor Bernie explained that these insidious conditions although usually associated with old age can set in at any time. It is because of his personal experience of the pain and suffering these conditions can cause that he and his partner chose this fund raising project. Current research has made serious inroads to the early detection and therefore more effective management/treatment, it would be good to say cure but regrettably this seems a long way off. President David endorsed Bernie’s remarks and expressed the wish that all District 9790 Rotary Clubs also get behind his partners project to ensure that there will be significant funds to hand over to these research projects in 2018. Charley the Black Bull made his appearance at the Rotary Club of Alexandra’s meeting last Wednesday night. 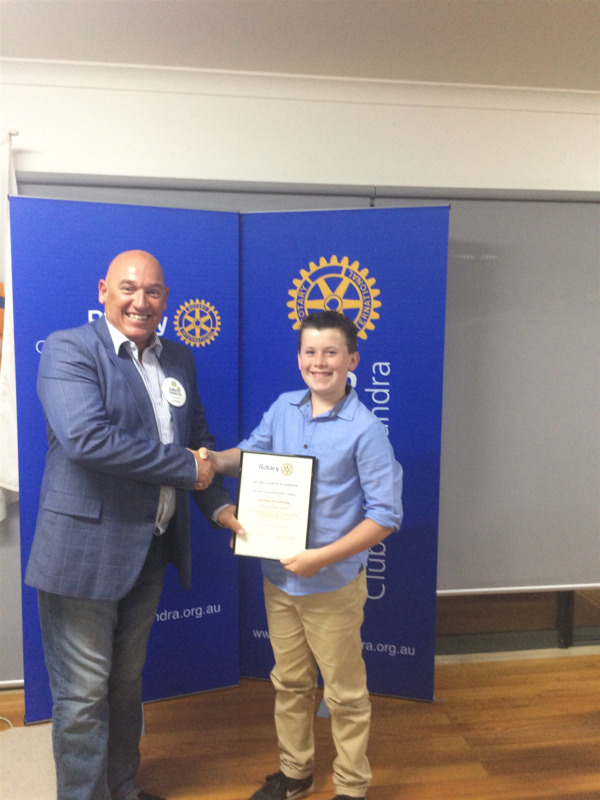 Charley was accompanied by Rotary District 9790’s District Governor Bernie Bott on his offical visit to the Rotary Club of Alexandra. Charley sat in with Bernie’s meeting with the Rotary Club board of Directors as they shared its plans for Rotary activities in Alexandra and District for the next 12 months. The meeting also included a frank discussion of the future of Rotary and the changes that are in place to ensure that Rotary remains a vibrant and effective service organisation. Charley heard how the Rotary Club of Alexandra continues to support Rotary international through an annual donation of $100 per Rotarian per year, how projects like the annual Auto Swap Meet and the Rotary Art Show are the big fund raiser for the club, the continued strong support for youth and young adults, development of vocational excellence through Pride of Workmanship and Business excellence awards, many and varied Community service projects including Carols in the Park and Australia Day celebrations. 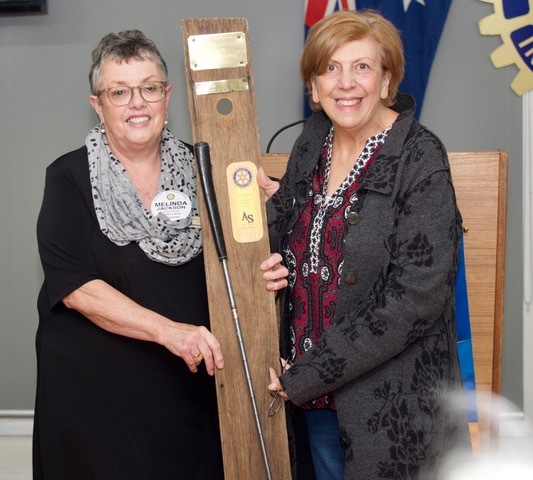 Through Bernie Charley reminded the board and later the club members and guests of the unique opportunity that the District Conference in Yarrawonga next year provides for Rotary to both show case and share the vast variety of ways Rotary is making a difference. 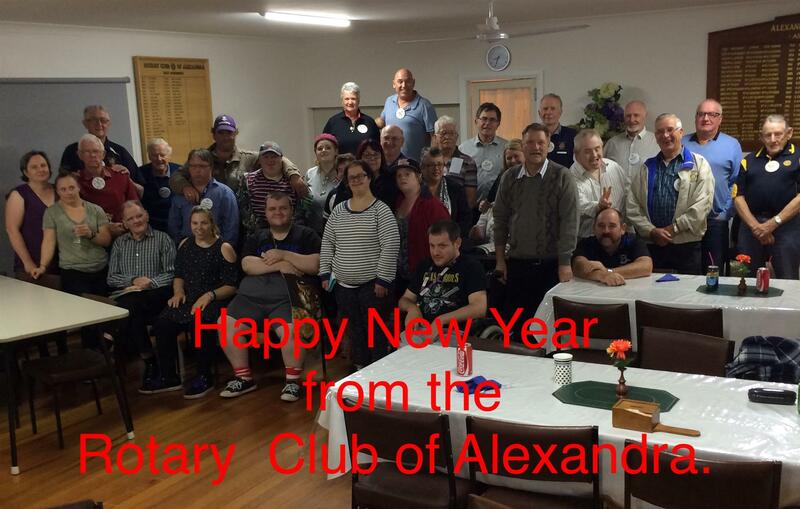 Despite Rotary being 112 years old local Clubs like Alexandra (one of 33000 clubs all over the world)continue to provide vital and valuable service and personal development to their community. Charley took centre stage as Bernie was guest speaker for the Rotarians and their guests. There is no doubt that this Little Black Bull will have a wealth of experience and so many stories to share by the time he gets to the District conference. President David Dimech confirmed there will be a contingent from Alexandra in attendance at conference as well as a display to share the ways the Rotarians from Alexandra are making a real difference. Lift the Lid with the District Governor for Mental Health Research. Rotary Club members from Alexandra are on a mission to ‘Lift the Lid on Mental Illness’ by raising money for mental health research this October for Mental Health Month. Almost one in five Australians will experience a mental illness every year, and nearly half of the population (45%) will experience a mental illness at some stage in their lives. Lift the Lid on Mental Illness is a new National mental health fundraising and awareness initiative of Australian Rotary Health, that aims to raise funds for mental health research and ultimately improve the lives of all Australians. “Everyone knows someone who has been affected by mental illness in some point during their lives, so if anything, please consider that you will be helping them and many others if you decide to make a donation,” Ms Gillett said. A night of excitement and fun with the Seymour Rotarians. The handball and quoits resulted in a draw. The presidents arm wrestle was also a draw. So the night was decided on the toss of a coin. 100% of the money raised during this year's Hat Day campaign goes directly to research helping the one in five Australians affected by depression, anxiety, schizophrenia and many other illnesses. 1 in 5 Aussies are affected by a mental illness every year, but it’s not something we tend to talk about. These illnesses include anxiety, depression, eating disorders, dementia, schizophrenia and many more, you’ll know how important it is for Australia to shine a light on mental illness. Rotary Club members from Alexandra and district are on a mission to ‘Lift the Lid on Mental Illness’ by raising money for mental health research this October for Mental Health Month. Australian Rotary Health CEO Joy Gillett OAM said she hopes their fresh new campaign will encourage not only Rotarians, but the wider public to support mental health research. Dig out those unwanted items and book a stall. Only $26 to book a site. Come look for treasure $5 entry fee. Food stalls on site. Rotary club of Alexandra projects for this Rotary year. College Citizenship Awards, N.Y. S.F., James Gillespie is the successful applicant this year. Alice Sloan 10 day trek. Year 7 all abilities program. Community Service. 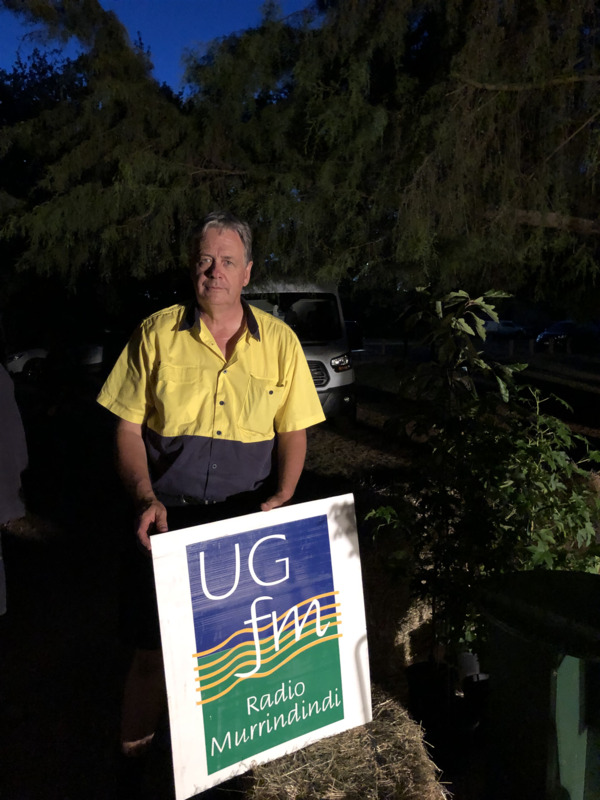 Budget $10,000:00 Australia Rotary Health Research $1,000:00 Bowel Scan $1,000:00, Community Police Award, upgrade trees in Leckie Park, continue footpath behind Bedrock, gardening upgrade at Rotary Park, manning gates at Open Gardens, Emergency Medical Booklets.